Born during a time of war and upheaval, St. John’s came into being at the height of the Civil War on October 2, 1862 when a gathering of seven men— John Levering, Henry Hoppin, William Lawson, Isaac Hazlehurst, Thomas Lodge, Dr. J.W. Lodge, and David Morgan—voted that “the demands of this neighborhood require an Episcopal church be organized without delay; the same to be a free church [without pew subscriptions]”. A contract was subsequently signed on December 2, 1862 for the erection of a wood framed church to be built on this site, which had once served as an encampment for a Georgia regiment of the Continental Army on its return from Valley Forge in 1777. While the little frame church was being built, President Lincoln appointed a National Day of Thanksgiving to take place in August of 1863, calling on all people to assemble at their houses of worship to acknowledge God’s mercies in giving notable victories to the armies of the Union forces. In response, the builders of St. John’s hastily finished in time for a service to be held in the new church on the 6th of August 1863, the Feast of the Transfiguration. The first sermon was preached that day by the Rev. Alexander Shiras of Philadelphia. The Rev. Dr. G. Emlen Hare, then residing in the neighborhood, officiated until October 15th, when the Rev. Francis Arnold was chosen as first Rector of St. John’s. The church was consecrated on October 20, 1863 by the Rt. Rev. Alonzo Potter, Bishop of Philadelphia. The campus was further enlarged to accommodate the needs of this nascent congregation: in the fall of 1864 a rectory was built, and in the summer of 1869 the church was enlarged with the addition of transepts to nearly double its original size, and its interior and fittings “greatly improved”. 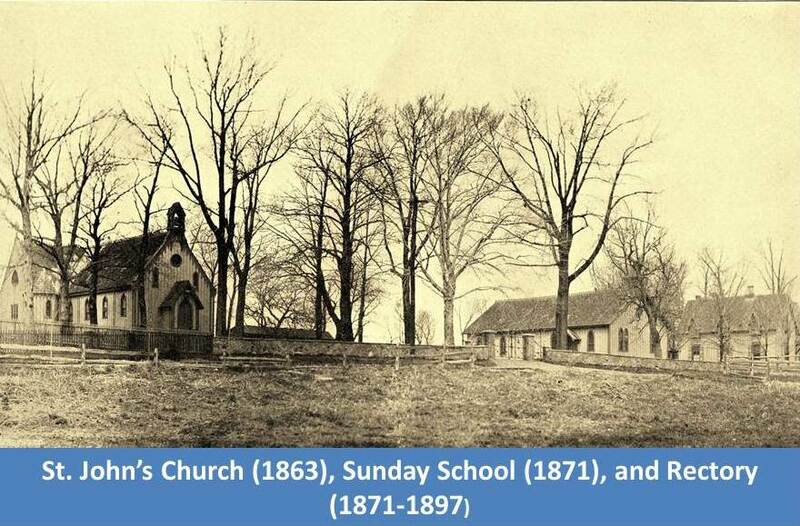 In the spring of 1871 a Sunday school building was erected between the church and rectory, on a spot that had once served as a former rock quarry. St. John’s second Rector—the Rev. Charles Fischer—started service on December 1, 1871. During the term of his ministry, the number of parishioners greatly increased, and the rectory was enlarged. St. John’s third Rector, the Rev. C.C. Parker, began his ministry in December 1874, and under his guidance, the large country parish grew. To meet the needs of increasing numbers of Episcopalians moving to this area, St. Asaph’s was established in territory formerly served by St. John’s. By 1894, the results were disastrous: large numbers of parishioners had left St. John’s; the Rev. Parker resigned; and St. John’s was forced to close its doors. By 1897, when the three frame structures had served their purpose and could no longer be adequately maintained, a generous gift from Maria Simpson, the widow of a longtime vestryman, now made it possible for reconstruction. 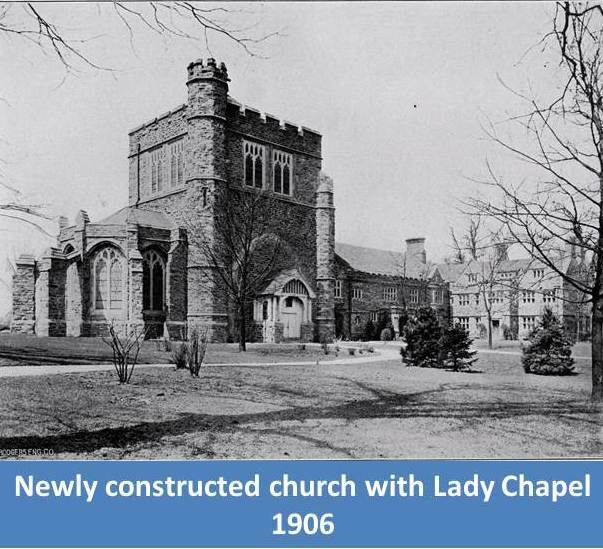 In February of 1897, the vestry accepted plans for our current campus of stone buildings in the English Perpendicular style, by the architectural firm of Milton B. Medary, Jr. The parish house was completed in the fall of 1897 and the rectory project was subsequently made possible from an Easter Day offering in 1900 by Frederick McOwen, followed by a substantial donation by John Marston for the building of our church. On the afternoon of July 23, 1900 Bishop Whitaker, along with other clergy and attending laity, baptized Mr. Marston’s grandson in the old frame church, and then together walked next door to lay the cornerstone for the new church building, crossing from the old to the new, a point that was not lost on the attendees that day. “I do not doubt,” said the Bishop, “that it was though the providence of God that the disbandment of this congregation was not suffered to prevail. Since 1895, when the church was reopened, God’s blessing has rested on it. The congregation has steadily increased, the Sunday school likewise; and beautiful as these grounds were… that which we see from these walls gives promise of far greater beauty… Here is a noble educational work being done for Christ and His people….” The opening service in the new church took place on August 6, 1901, the Feast of the Transfiguration, exactly 38 years to the day of the opening service in the original building. By the summer of 1906, an additional gift from Frederick McOwen allowed the construction of the Lady Chapel, along with its appointments: lovely stained glass windows, stone altar and reredos, altar vessels, as well as other furnishings. The stained glass windows are the work of the Nicola D’Ascenzo studio of Philadelphia, and illustrate the Church’s ancient canticle, the Te Deum Laudamus. The window over the altar represents the Annunciation, and the small window in the passage, the Magnificat. In 1926 the congregation moved to enlarge the church in accordance with the Medary comprehensive master plan by the addition of the nave with gallery and side rooms on the east side of the church tower, thus completing the planned quadrangle. Funds for the construction of the nave were obtained from parishioners and friends by the Vestry. In quick succession, the nave was built and consecrated in 1926. Hardman Studios were again retained to provide the memorialized stained glass windows in the nave. And, at an even later date, the windows in the upper tower depicting the biblical prophets were crafted by the studio of Nicola D’Ascenzo and installed. 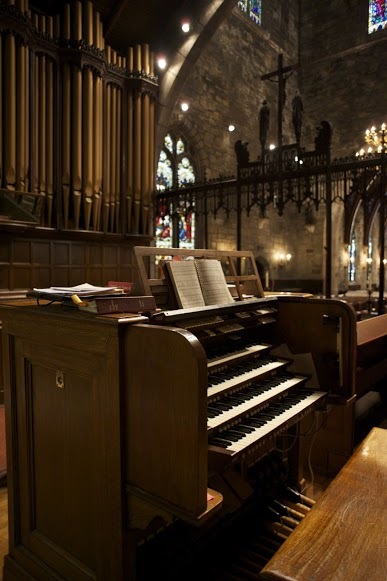 Dr. Tily, who had a lifelong career with the Strawbridge & Clothier department store, donated the funds for St. John’s fine Moller pipe organ, which is located in chambers in the chancel and tower. He served for over 30 years as organist and choirmaster of St. John’s, in addition to serving on the Vestry. As a faithful member of the parish, he also donated the organ screen and some of the windows in the nave. 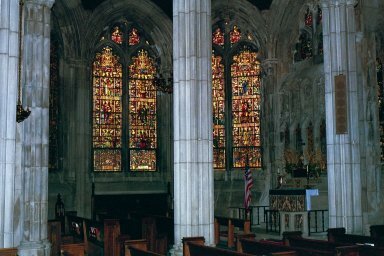 Upon his death in 1948, the employees of Strawbridge & Clothier gathered funds and donated the large stained glass window over the entrance doors and gallery; it is entitled “The Nativity.” The window was later dedicated in 1951 by Bishop Hart, and it is one of the last works of the studio of Nicola D’Ascenzo. In 1956, with the fortunes, if not the spirits, of St. John’s at low ebb—with the beautiful buildings in desperate need of rehabilitation and the number attending its services ever decreasing— a young man was called to be the parish’s seventh Rector. The Rev. Paul Kintzing, Jr. came from St. Mark’s, Philadelphia, to awaken the parish with renewed spiritual and secular activities. In the summer of 1963, St. John’s celebrated its centenary. The occasion provided an opportunity for celebration, but also for renewed dedication to stewardship. A Centenary Planning Committee was formed, and campus restoration plan and projects ensued. As part of that effort, the Centenary Tower was built off of what is now the school. The Rev. Robert Keel became our eighth Rector (1966 – 1984). During his tenure, he implemented the new liturgical reforms that brought us from being a Morning Prayer parish to one with the Eucharist at its core of corporate celebration. He also had the courage to expand the mission of St. John’s to encompass social justice and outreach, and led the parish through the societal turbulence of the day. Today, the people of St. John’s continue to put “new flesh on these old bones” as we look beyond the stone walls and verdant green of our lovely campus to our community of “living stones” or faith-in-action. 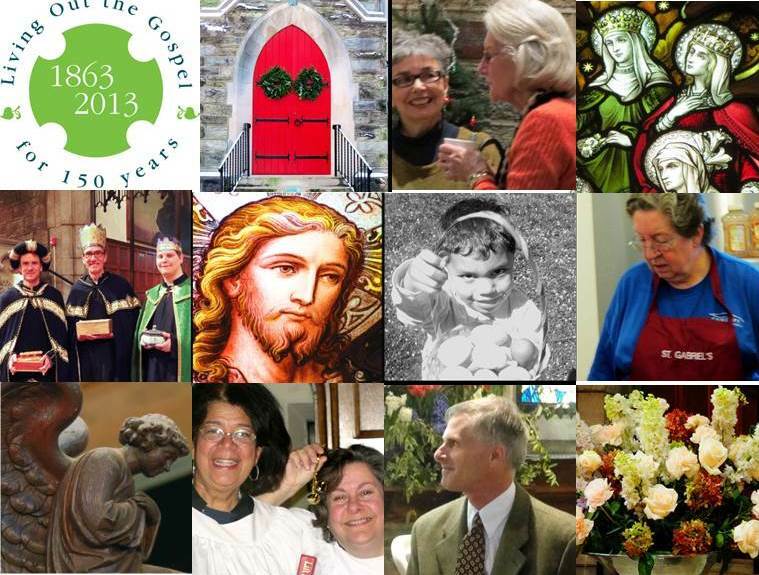 Within the last few years alone, our parish has seen a resurgence of growth and vitality. The parish rolls have doubled (and continue to grow) with the addition of new families and younger couples, and as we practice our own version of radical hospitality, those who have not felt welcomed elsewhere find a home here at St. John’s. True to the spirit of our forbears, we continue to live out our inward faith by outward action. The majority of the many hands that make up our faith community are quietly involved in ministries of outreach to others. 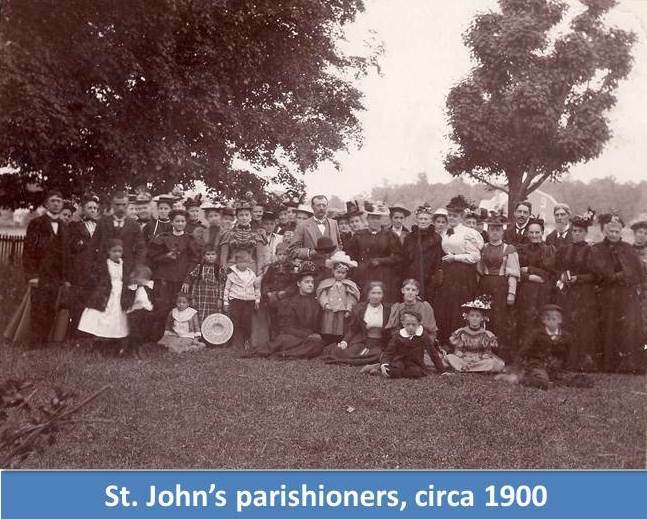 As our rich parish history illustrates, St. John’s has weathered many storms, but the people of St. John’s have always endured! We are truly thankful for the work that has been done here in the preceding 150 years in the name of Christ. By their lives, sacrifice, and perseverance the people have St. John’s have been a testament to our mission of faith, hospitality, and service to others. May we too play a part in what is yet to come, God willing, for the next 150 years!